"Often our health care team only sees us for about 15 minutes several times a year, and they might not have a sense of what our lives are really like. Today, let’s pretend our medical team is reading our blogs. What do you wish they could see about your and/or your loved one's daily life with diabetes? On the other hand, what do you hope they don't see? (Thanks to Melissa Lee of Sweetly Voiced for this topic suggestion.)" If you've been reading this blog for a while, then you know how much I LOVE my endo and CDE. I absolutely adore them. They don't read my blog, but they know about it. They know how involved I am in the Diabetes Online Community. And they know how much you all have helped me. My endo and CDE are both quite supportive and understanding. Especially my CDE. She has great empathy for her patients, and that comes across in her interactions. I felt safe enough with her to ask for help. If my endo and CDE were to read my blog, I hope they would see that I try. I try damn hard. We all do. Some days are easy, some days are impossible. That a person's A1c is not always the best indicator of their health. For any medical professional who might read this blog, this is what I want you to know: empathy and empowerment inspire change. That's what we as patients need. So very well said, Jess. Thank you for this. Sorry Allison! 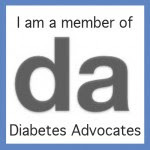 CDE stands for Certified Diabetes Educator.